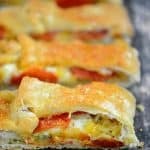 This Easy Pepperoni Stromboli recipe is a family favorite. 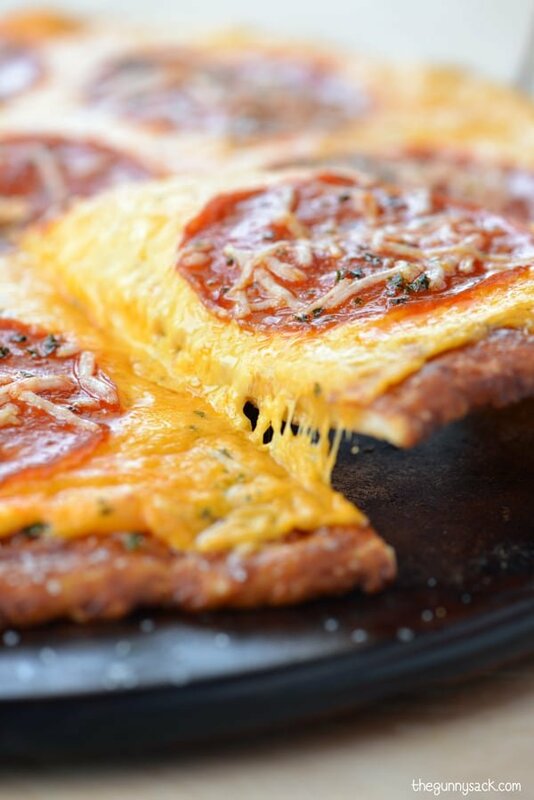 Crave-worthy bread dough wrapped around layers of cheese and pepperoni! 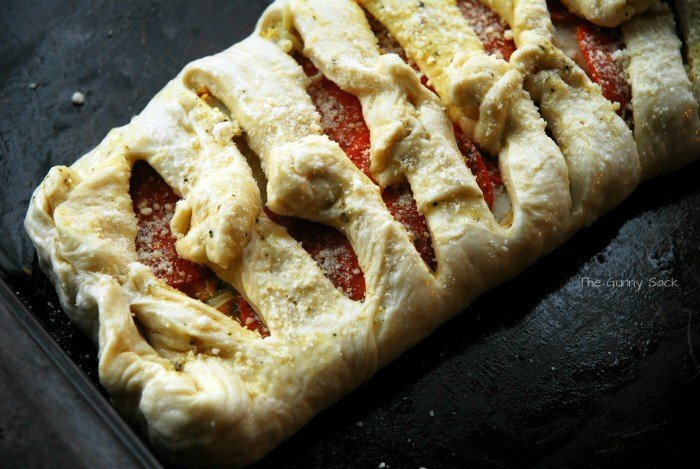 I’ve been making this easy pepperoni stromboli recipe for almost 10 years and my family would still eat it weekly if I made it for them that often! 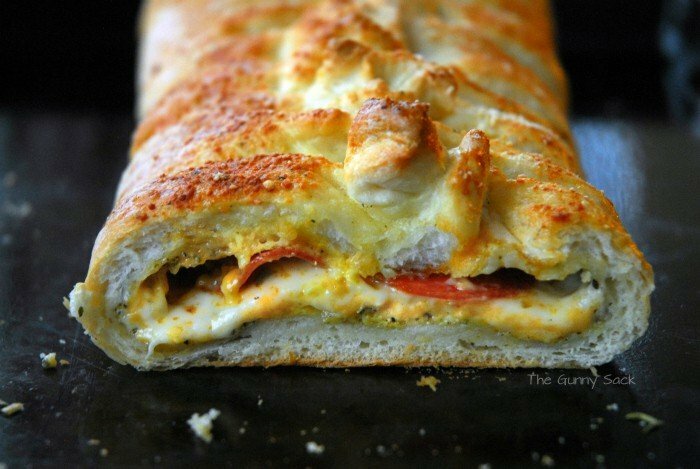 My husband and daughters love it with pepperoni and my son prefers plain cheese stromboli. Start with the dough. 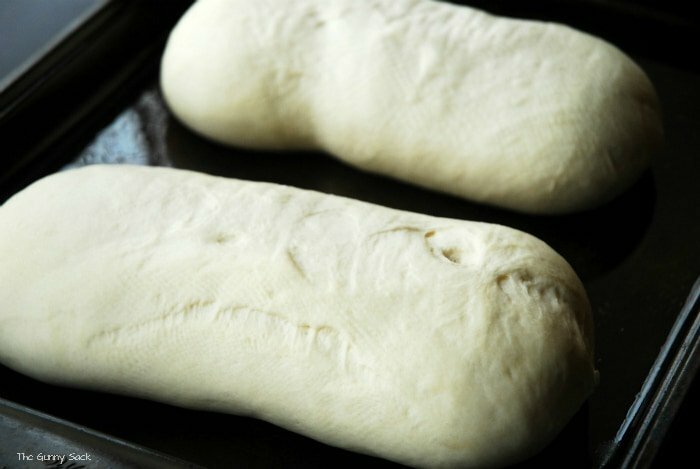 I use frozen bread dough because it is so easy but you can make homemade bread or pizza dough if you prefer. Let the bread thaw and rise. You only need ONE LOAF for this recipe but I always make two for my family as you can see in the photo above. Spread on the loaf of dough into a greased jelly roll pan or a sheet pan. 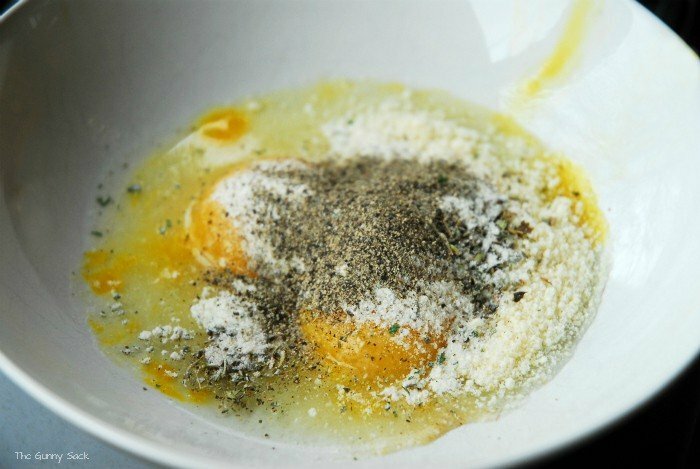 In a small bowl, mix together a whole egg, an egg yolk (separate the egg white into a separate bowl and save for later), olive oil, grated parmesan, powdered ranch dressing mix, Italian seasoning, garlic salt and black pepper. Spread the egg filling into the center of the dough. Top with shredded cheese, slices of pepper jack cheese and pepperoni. 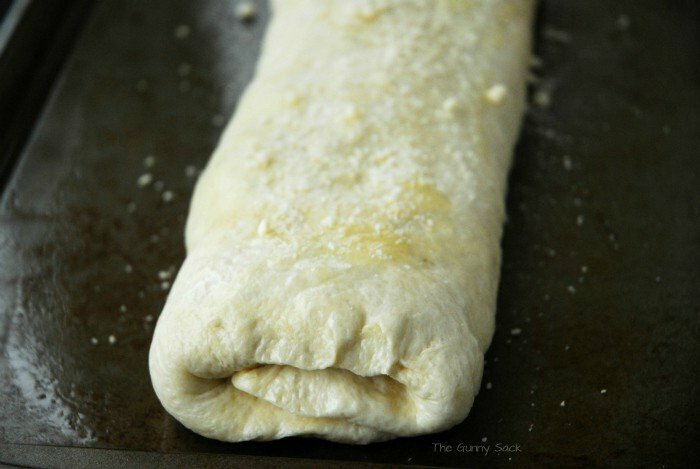 There are a couple of ways to fold the stromboli. The first one is by folding up the ends and then the sides of the dough. Pinch the seams together and flip the entire loaf over so that the seam rests on the bottom. The second way is to cut small slits along the length of the dough. Pull dough segments from opposite sides of the dough to the center and twist/pinch to hold them together. Brush the top of the stromboli loaf with the beaten egg white and sprinkle with grated parmesan. Go ahead and sprinkle with additional Italian seasoning if you want. Bake at 350°F for 35-40 minutes, until golden on top and cooked through. 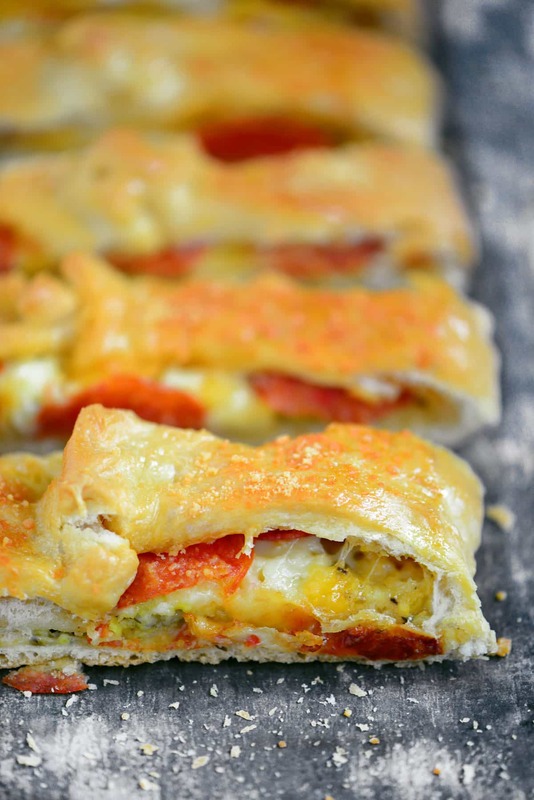 The smell of this easy pepperoni stromboli, when it is baking, is amazing! Once I bought it to my friend’s house all ready to bake. She lived in a townhouse at the time and one of the women from a couple of doors down smelled it baking and just had to have the recipe! And when you cut into the stromboli you can see the delicious layers inside. 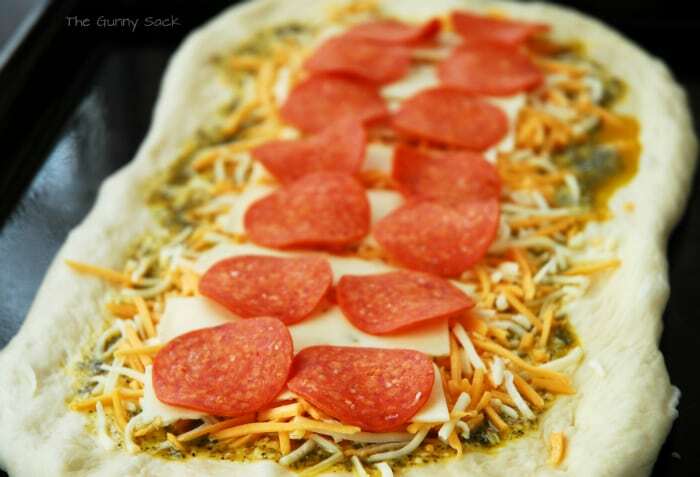 This Easy Pepperoni Stromboli recipe very versatile and is sure to become a popular request. 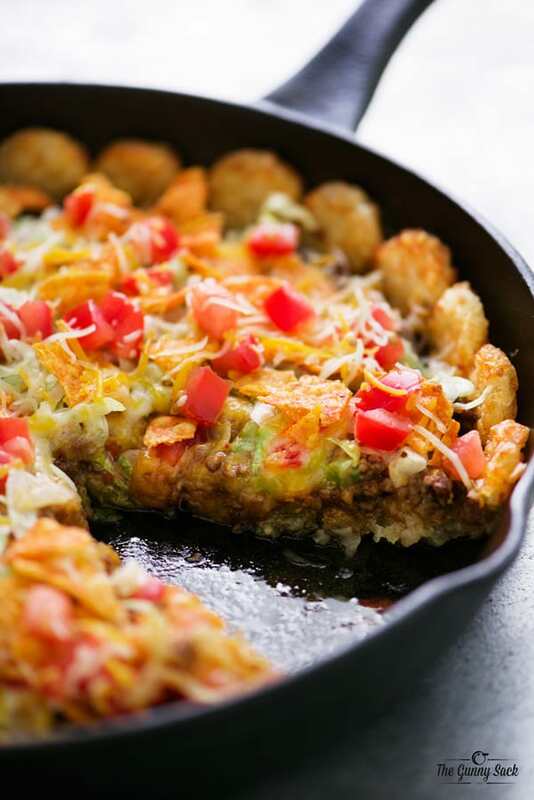 Add your family’s favorite seasonings and toppings to make it your own. Spread dough into a greased jelly roll or sheet pan. In a small bowl, mix together a whole egg, an egg yolk (separate the egg white and set aside), olive oil, one tablespoon grated parmesan, powdered ranch dressing mix, Italian seasoning, garlic salt and black pepper. Spread the egg filling into the center of the dough. Top with shredded cheese, slices of pepper jack cheese and pepperoni. There are two ways to fold the loaf. 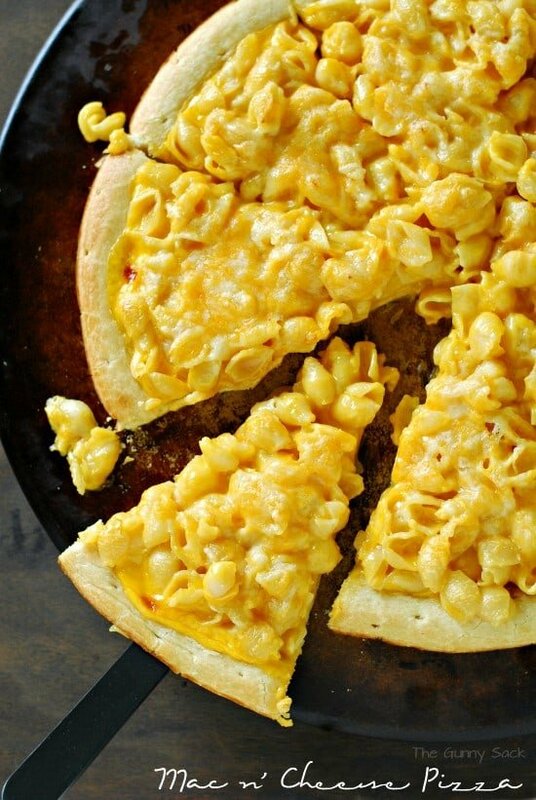 You can fold the sides of the dough up and over the toppings in the middle. Press and seal the seam. Turn the whole loaf over so that the seam is on the bottom. Sprinkle with one tablespoon of grated Parmesan cheese. Bake at 350°F for 35-40 minutes, until golden on top and cooked through. Recipe adapted from one given to me by my aunt Karen. Just curious…do you have any stromboli recipes using alfredo? What a great idea, Renee! I don’t have one, but it sounds delicious. I just use the jarred alfredo sauce (the roasted garlic one is amazing) in place of any pizza sauce for our pizzas and calzones. It would be stellar in this too. I like the alfredo with chicken & artichoke. This looks AMAZING! All of your recipes do. Thanks so much for sharing. 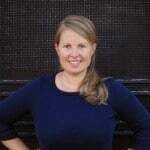 Thanks so much Jerilyn! I just made this for dinner on Monday and it was sooo good! I haven’t had stromboli in such a very long time! This just might need to happen here the next time we make home made pizza!!! I can’t believe you got so much snow…that’s terrible! I love pizza! This sounds soooo good!! I know! Thanks for the sympathy Holly! The kids are home with a snow day today and they are predicting more snow tonight! Great idea! My husband loves stromboli 🙂 Sorry you are still getting snow. We finally got warm weather here but it skyrockets to 90! I love stromboli! SO good! Pizza is my addiction. Snow = bummer! I actually went to the store this morning to purchase pepperoni…not really knowing what to make with it. But since I already have everything for this, I’m going to make it this afternoon for my high school son and his friends that come over (every day) for lunch! It’s really making me hungry this morning! (I better get on it then!) thank you for sharing! This looks so incredible and tasty! Your pictures make me drool! I love pizza recipes!! This one looks great- awesome photos, too, by the way! Awesome! Yours looks great. 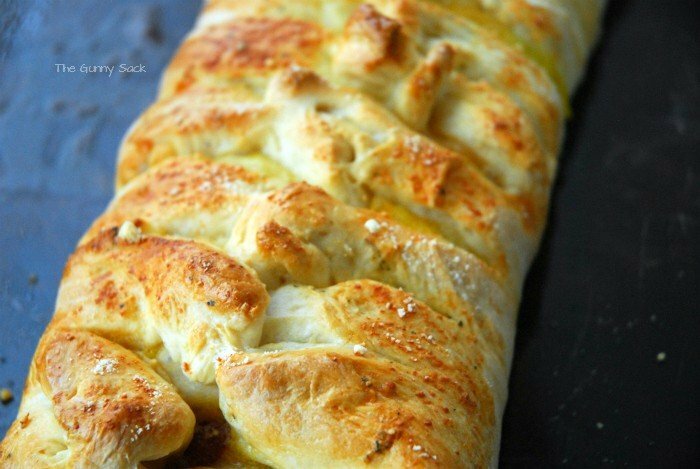 My mom gave me her stromboli recipe-very similar to this when we got married. It’s my husband’s absolute favorite meal! We have it once a week or so-it’s so easy! Thanks Carrie! I adapted the recipe from one that I got from my aunt and I have no idea where she got it from. We will have it quite often too and then I forget about it and really miss it! Yummo Tonia. That looks great. I think my boy would love that.